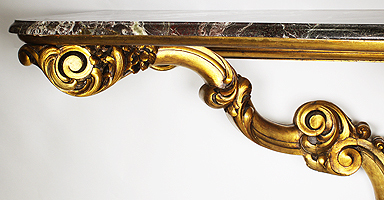 A Rare French 19th-20th Century Baroque Style Gilt Wood Carved Wall Console Table with a veined deep burgundy Sarancolin marble top. 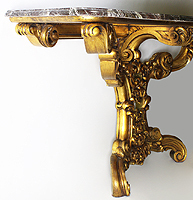 The "Tree" style ornately carved console with a center root carving protruding and supporting to each side the substantial marble top with serpentine sides. Circa: 1900.